Michalis Nikiforakis carries out a long-lasting promise. To outline with light the image of ‘LYCHNOSTATIS’. He concentrates on his theme, by blaring his look right and left, like a sprint runner who keeps his eyes on the line. His eye becomes a filter, vaporizes the light, winnows the feeling. Within the frame he fits the inner frame. As if he tries with his camera to spot in the image whatever is trying to remain unspotted. Blow-up, our look plays “hide-and-seek”. Photography Exhibition "Images of disappearing Crafts & Occupations "
Group Photography Exhibition "Images of disappearing Crafts & Occupations " consisting of 100 photos is open to the public in the Museum’s Hall “O. Elytis”. Photographic material derived from the archives of the newspaper "Haniotika Nea", of the photographers Fanis Manousakis, John Papadakis, Stavros Psyllakis and the Cultural Society of Crete, together with photos by 52 photographers from all parts of Greece, present vividly the crafts and occupations of the past. The exhibition has been hosted last year in Chania by the Cultural Society of Crete and aroused great interest from the locals and tourists. The director of the Museum LYCHNOSTATIS, Yiannis Markakis, participated as a lecturer in the educational seminar, organized by the National Centre of Public and Municipal Administration at Heraklion in 17th June. The theme of the seminar was: "Public Administration & Administration of cultural affairs", addressed to civil officers of cultural and public sector. The director of the Museum explored the theme: "Museum as an organiser of cultural events and fund-raiser in the European level". The poet and Museum's director Yiannis Markakis participated in the theme evening "Fairytale, Myth and Folk poetry : The forgotten paths"which took place in Athens under the organization of the Center Artists' Expression "Mairivi", and the Center of studies of Myths and Fairytales. On the theme evening participated also the writer Paulina Papoudi, Vasilis Gouroyiannis, and also the story-teller Stelios Pelasgos. Yiannis Markakis presented the interrelation between Cretan folk poetry and modern poetry as well as their presentation on the collections of the Museum 'LYCHNOSTATIS'. "Dancing with the bees"and "Carving the Darkness"which have been designed and applied during the years 2003-2006. The director of the Museum LYCHNOSTATIS participated in the workshop for Cultural Inherence from the Islands, organized by the European Museum Forum and the International Commitee of Islands, INSULA, working under the flag of UNESCO. Other participants of the workshop were teachers from universities, directors and museum staff from six different countries (France, Italy, England, The Netherlands, Cyprus and Greece). The workshop had as goal to compare the differences and similarities of the cultural inherences of the islands on European ground, but also to establish a network of cooperation between Museums and cultural organizations of the islands. A concert dedicated to Manos Hatzidakis by the choire of the Cultural Centre of Hersonisos Municipality directed by Efi Betoulaki. documentation program of oral tradition. ".I KNOCK AT THE WORDS AND THEY DON'T OPEN ME." "LYCHNOSTATIS "young poets from Crete will present their poem-collection. Photos : Zachariah Katsakos, Jiannis Idomeneos. 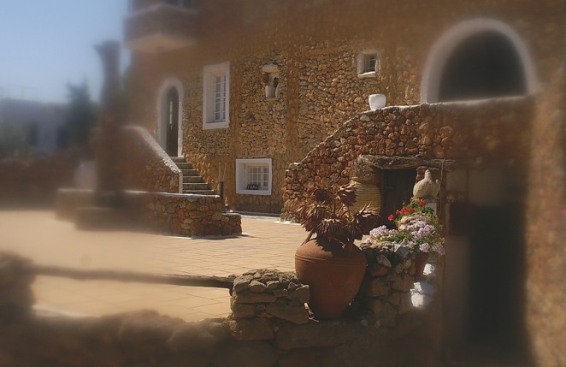 At the congress, which takes place in the municipal centre of Sitia in 18th -19th August, the Cretan Open - air Museum "LYCHNOSTATIS"has presented the theme "Cretan folk poetry & Mandinada as an annotation form memorandum in the expositions of the Cretan Museums "( 19/8 ,10.20 am). The central theme of the congress is "The Cretan Poems (Mandinades) and rhymes from Kornaros until Fragoulis ".The conference is organised by the Centre of Cretan Literature together with the Cultural Centre of Sitia Municipality. Fig feast - "LET'S CALL THE FIGS...FIGS"
In the context of the cultural events of Hersonisos Municipality the Association of Friends of the Open - air Museum "LYCHNOSTATIS"organized a "Fig Feast"on Saturday 5th August on 7.00 am in the Museum "LYCHNOSTATIS"in Hersonissos. "Let's call the figs ..figs." (Literature about the fig, the first fruit in the history of humanity). The event ended with Cretan poems (Mandinades) of the members of the Committee of Friends of Kostis Fragoulis. The event closed with music of the violist Vangelis Vardakis, one of the most important artists in his interpretation of the music of Stratis Kalogeridis. The Open - Air Museum "LYCHNOSTATIS"participated in the events, organised, from 25/7/06 until 29/7/06, by the Organization of Lyceum of Greek Women in Heraklion with the cooperation of Cultural Centre Ethnarchis Makarios C΄ of Cyprus. The congress was organised in the context of the program "Crete and Cyprus in place and time ". The director of the Open - Air Museum "LYCHNOSTATIS" Yannis Markakis presented his project with title "Traditional arts and professions: a modern look in old ways"in the Byzantine Church of Saint Markos. SECOND EXHIBITION "VIEW ON CRETAN TRADITION "
The Museum LYCHNOSTATIS participated in the second exhibition "View on Cretan Tradition ", organized by the Council of Heraklion Province. The exhibition took place in the international exhibition centre of Gournes in Heraklion, 12 - 17 July 2006. The director of the Museum LYCHNOSTATIS, Yannis Markakis, participated as a lecturer in the educational seminar, organized by the National Centre of Public and Municipal Administration at Heraklion in 30th June. The theme of the congress was: "Museum and Local community", addressed to professionals of cultural and educational sectors. The director of the Museum explored the theme: "Museums and local community: stimulating the community". The Open - Air Museum "LYCHNOSTATIS", participated in the third congress of Museology with theme "Audiovisual media as cultural inheritance and it's use for the Museums ". The congress took place in the Aegean University in Mitilini, from 5 - 8 June 2006. In the context of the congress the international committee AVICOM -ICOM organised the annually festival of Audiovisual Equipment in the Museums. The director of the Open - Air Museum LYCHNOSTATIS presented the C.D.ROM "Technology yes, Tradition necessary ". INTERNATIONAL MUSEUM DAY - "Museums and Young Generation "
The Cretan open - Air Museum "LYCHNOSTATIS"participated for the 5th consecutive year in the celebration of the International Museum Day -organised by the National Hellenic Committee of ICOM - under the central theme "Museums and Young Generation"applying a new educational program "The Colours and their deeds". The program, "The Colours and their deeds", was first applied in 18 May 2006, with the students of the 46th Elementary School of Heraklion in the Museum gardens. The program was planed and materialised by the Educational department of the Museum in cooperation with the Museum pedagogue Chrisoula Chalabalaki and the painter Manolis Frankiadakis as well as the founder of the Folklore Museum in Sitia, Eleni Anipsitaki - Daouraki. The Friends' Association of the Museum "LYCHNOSTATIS" and the Municipality of Hersonisos organize a Christmas evening with the story-teller Stelios Pelasgos and members of the Center for the Entertainment of Old People of Hersonisos. The event is taking place at the Cultural Center of the Parish of Hersonisos. "Accessibility - Educational Programs for Impaired People"
"Cultural Policies of the European Union"
At the Seminar for the training of the staff of the Ministry of Culture which takes place in Athens for four days and is organized by the National Center of Public Administration, Yiannis Markakis develops the subject "Cultural Policies of the European Union". 1st National Conference for the Folk Culture of Crete "Localities: Αντιστάσεις, Changes, Mixes"
The founders of the Museum George and John Markakis make their announement "The Cretan rime (mantinada) as texts for the interpretation of the museum's exhibits" at the 1st National Conference for the Folk Culture of Crete "Localities: Αντιστάσεις, Changes, Mixes". At the conference, which is taking place at Hania by the Historic, Folk and Archaeological Corporation of Crete and the University of Thessalia, the Head of the Museum's Department of Educational Programs Mary Baritaki makes the announcement "The childrens' understanding of the Folk Culture". and donors of the Museum Eleni Anipsitaki-Daouraki and Nikos Garefallakis for their long contribution and scriptive work. The event is taking place at the municipal hall of Iraklion, "Androgeo". "Cultural Heritage & Local Development- the role of the Museums"
Yiannis Markakis represents Greece at the International Conference of the International Council of Regional Museums ( ICR ) "Museums and Local Development". The subject of his announcement is "Cultural Heritage & Local Development- the role of the Museums". The conference is taking place in Merida, Mexico and is organized by the International Council of Museums (ICOM ). Implementation of the New Educational Programs and Activities of the Museum «Life is the essence, and Nature is the reason» and «Fair with the bees» with members of the Center for the treatment of Addicted People of Rafina «Paremvasis» and the Center for Children with mental Disabilities "ZOODOHOS PIGI". These activities are taking place in the frame of the initiative "Volunteerism and Environmental Protection", an initiative which is 50% financed by the Ministry of Space's Arrangement and Public Constructions. They are implemented by the Association of the Museum's Friends in cooperation with other public institutions. The director of the Museum Yiannis Markakis and member of the administrative council of ICR participates at the annual meeting at Nesbyen, Norway for the preparation of the activities of the International Council of Regional Museums for the year 2003. At the 1st National Symposium «Preparation and production of educational material for environmental education» the representative of the museum Yiannis Markakis organizes a workshop with the subject «The costal lilium returns to the coast». The Symposium takes place at Piraeus and is organized by the University of Piraeus and the Institute for the Protection of the Environment and the Cultural Heritage. The society of friends of Lychnostatis museum and the Thrace Shadow Theatre are organizing a performance of "Karagiozis" at the museum at 21:00 in the evening. "LYCHNOSTATIS" is participating in the opening of the Centre for Drug Dependant Persons in Nea Alikarnassos. The museum will display a selection of exhibits from local folk culture. 1st INTERNATIONAL SYMPOSIUM on "TECHNOLOGY AND TRADITION"
The influence of technological evolution in daily life & social structures in Europe in the last two centuries"
Y. Chlouverakis, Pharmacist, Hon. Member of the Friends Association of museum "Lychnostatis"
Fromm Annette, Museologist-Folkorist - U.S.A.